The splendiferous Savoy Hotel’s American Bar holds a special place in the history of cocktails since it introduced American cocktails to a wide-eyed European public for the very first time. When the total ban on alcohol in the 1920s Prohibition Era America brought thirsty Americans over in their droves, the Bar’s popularity soared. Prohibition also brought across barman Harry Craddock, who famously came and stayed for 40 years, authoring the legendary Savoy Cocktail Book, still regarded as the bartenders’ bible. The American Bar was birthplace to many classics - The White Lady, the Corpse Reviver, the Hanky Panky, to name a few. Wedding Bells was invented to toast Queen Elizabeth’s wedding to Prince Phillip; Moonwalk for Neil Armstrong’s 1969 moon landing; and Speedbird for Concorde’s first flight. The Savoy was London’s original luxury hotel, the first to have electric lifts, lights and 24-hour room service. This most elegant and atmospheric venue has been a favourite of the rich and famous since it opened in 1889. The long rollcall of celebrity American performers or guests includes Marilyn Monroe, Bob Dylan, Fred Astaire, Judy Garland and Humphrey Bogart. Gershwin premiered his Rhapsody in Blue here in 1925. Frank Sinatra liked to sneak into the Bar and play the piano. As you ascend the stairs to the American Bar, take time to gaze and gawp for yourself at its wonderwall of star photos and memorabilia. Nowadays you’ll find the charming and award-winning Erik Lorincz presiding over the American Bar, welcoming guests from all corners of the globe to cosy up with cocktails including his signature drink, the stylish Green Park. As it has for decades, classic jazz is played seven nights a week on the famed baby grand. Erik joyfully described to us the honour of creating a special cocktail for the Queen’s Diamond Jubilee celebrations last year. This led to Diamond Jubilee Punch, fittingly served up from the Lalique Fountain in the Savoy’s forecourt, a forecourt famed as the only street in England where vehicles must drive on the right. The recipe called for 36 bottles of gin, 40 bottles of champagne, 90 litres each of Earl Grey Tea, lemon juice and iced sherbet. Summer 2014 may well see the fountain overflow again as the Savoy celebrates its 125th birthday. Unsurprisingly, the cocktail menu is a wonder to behold. Modern ladies favour the lasciviously fruity Pink Collins, champagne cocktails or the sherry, port and rum combo making up the Malecon, while gentlemen prefer classic drinks like Dry Martini or an old fashioned Maid in Cuba is a spirited concoction of Bacardi rum, cucumber, mint and a hint of absinthe. If you’re looking for a nightcap, American Bar has a strong selection of ‘lullaby libations’ like Spiced Milk, Savoy Eggnog and lovely Erik’s absinthe- based chestwarmer, Monet Moment, created in honour of the French Impressionist who sketched nearby during his stay at the Savoy in 1902. If it’s a liquid breakfast you’re seeking, try waking the brain with a Morning Glory Fizz or a Bloody Caesar. Eccentric, charming, discreet and heavenly are phrases which trip easily off the tongue as you pass through the deceptively plain blue front door and enter the Zetter Townhouse cocktail lounge. ZTH, as it’s affectionately known, is the weird sister to Clerkenwell’s Zetter Hotel, one of London’s hippest hotels in its coolest quarter. Think Downton Abbey, stir in Potter’s Museum of Curiosities and garnish with a teaspoon of Hogwarts School, all set in this fascinating part of Dickensian London, once hedged with breweries and gin distilleries. You may remember seeing the winning team in a recent episode of BBC’s The Apprentice whooping it up with ZTH cocktails and wishing you were there. Although a relative newby on the scene, it’s already swept up a whole bunch of accolades, including Good Hotel Guide’s London Hotel of the Year, and has quickly become a favourite haunt for the capital’s cleverest cocktail lovers. Once inside, get comfy in a battered armchair in front of the crackling fire, surrounded by odd portraits, unusual knick knacks, taxidermied cats and a stuffed kangaroo, and believe us, you won’t want to leave. And then there are those cocktails! Behind all the magic is the talented and respected Grandbardaddy of alcoholic alchemy, Tony Conigliaro, of Drinks Factory and Colebrooke Row fame. His cocktails, cordials and infusions are inspired by old recipes for tinctures, bitters and herbal remedies. Wizard Tony’s new recipe book, Drinks, shows he knows as much about alcohol in perfume as in beverages and puts this knowledge to unique use in his cocktail creations. Our bartender William showed pure joy as he glowingly described each entry in ZTH’s cocktail menu, all innovative tipples, handmade with carefully sourced ingredients and love. Signature drinks include the naval- themed Master at Arms, a combo of Myers rum, port evaporation and homemade pomegranate based grenadine. The result is a deep, dark and deliciously addictive tipple, served in a rope wrapped stem coupette glass for added nautical flavour. The Koln (as in Cologne) Martini, is a heady mixture of dry gin, Martini and homemade citrus aromatics and described to us as drinkable perfume, whilst Somerset Sour toasts a cross-Channel alliance of Somerset cider brandy and Breton cider. The Flintlock, made with Beefeater Gin, gunpowder tea tincture, dandelion, Fernet Branca and burdock bitters, includes a showstopping performance with a lit fuse. Impressed as we were so far, our visit was lifted to an even higher level when our enchanting server, Aga, appeared with a fat spread of Bruno Loubet nibbles, including melt-in-the-mouth parmesan shortbread, pork crackling pigtails with apple sauce, rarebit baked spuds and ecstasy producing deep fried anchovy olives. Eat a bowl of those olives, down a couple of Masters at Arms and you’ll go to bed happy. That’s a promise. Having never seen the 1953 film version of From Here to Eternity, I expected the musical to be an epic tale of romance with plenty of kissing on a beach and rolling around in the surf. What I didn’t expect is a searing indictment of the US Army’s brutality against its own recruits. The musical goes back to the original autobiographical novel by James Jones, set in 1941 Hawaii, where the G Company, a peacetime Army unit is in training. Although a war is being waged halfway round the world, they think they are safe from harm’s way. This ragtag bunch of soldiers comes from poor backgrounds, joining up so that they have a job. The latest recruit, Private Robert E Lee Prewitt, is brought in by the fierce Captain Holmes for his boxing skills- a favourite sport amongst the company. Prewitt declares he has given up boxing and bugling, so Holmes decides to break him by rigorous and often cruel training methods. Prewitt, a man who sticks to his word, will not give in and gains a reputation for being insubordinate, as much as he tries to stay out of trouble. He is befriended by the cheeky Italian American Angelo Maggio, who puts up with daily verbal abuse from the other men, but takes it all with humour. Prewitt is dragged along by Maggio to a brothel where he falls in love with the mysterious and beautiful Lorene, played by the talented Siubhan Harrison. She is the quintessential whore with a heart of gold who just wants to make enough money to go back home to Oregon and marry a respectable man. Another strand to the plot involves the First Sergeant Milt Warden, a handsome Darius Campbell, who goes after Karen, the cold and remote wife of Captain Holmes with the chat- up line “I want to go to bed with you.” Instead of taking offense, they begin a torrid affair. The musical doesn’t dwell on the lovers, however, but deals with more uncomfortable issues: Private Maggio is being routinely beaten to a pulp by the Army’s Military Police after he is arrested outside of a gay club, a place he frequented to “roll the queers”, ie make money from homosexual men by spending time with them. It develops that the man who ratted on him was another soldier who is actually gay but has been hiding it by constantly bullying the much smaller Maggio in front of the other recruits. Maggio’s cruel treatment by the military police comes to a tragic end even before the inevitable bombing of Pearl Harbour in Act II. This is gritty stuff, an engrossing story which is well acted and disturbing. Robert Lonsdale is excellent as Prewitt; he is a very honest, truthful performer with a fantastic tenor voice. Darius Campbell, who some may remember as a runner up many years ago in Pop Idol, has made a career for himself as a West End star with his deep, lusty baritone; he has the looks, demeanour and the voice to be a matinee idol. 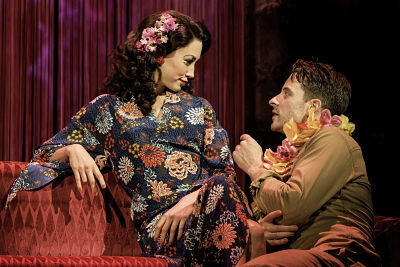 The best musical number was between these two leads, “Aint Where I Wanna Be Blues” but there is also a nice, believable playfulness between Robert Lonsdale and Siubhan Harrison in the song “Love Me Forever Today.” Ryan Sampson is outstanding as Private Maggio, with his ironic “I Love the Army”; he ends up being the one you care most about as he is cruelly mistreated by his own people. The strong chorus of soldiers, all interesting characters who come in many shapes and sizes, shone in the interesting choreography of Javier de Frutos, who has tried to capture the way soldiers really move rather than invent dance numbers. From Here to Eternity is a musical with substance that tells a memorable and moving side to the story about one of the most important episodes in American history. How have your curry experiences in the UK faired so far? Generally you can expect a lot of food and a lot of sauce, washed down with a lot of beer. Whilst adequate for the odd occasion, it’s generally not a high expectation of fine dining. Well you can forget these misconceptions when you arrive at Moti Mohal in Covent Garden, and experience Indian cuisine at its best. Moti Mahal was established in 1959 in Delhi, India. The first Moti Mahal Restaurant became world famous for comm ercialising the tandoor, allegedly inventing the Murg Makali, more commonly known as Chicken Tikka Masala, and attracting the likes of Jawaharlal Nehru, Indira Gandhi and the Kennedys. Opened in 2005 at 45 Great Queen Street, Moti Mahal in London benefits from a prime position in close proximity to the London theatre hub and offers authentic Indian cuisine in a contemporary and chic environment. As you enter the restaurant there is a long bar on the left, with the decor a mix of traditional and modern, in an airy, buzzy interior. The most striking feature is a theatrical glass fronted, ‘open’ kitchen which allows you to watch your food being prepared. The kitchen is amazingly calm, and at the helm is Head Chef Anirudh Arora. Inspired by the culinary roots of rural India, particularly along the famed Grand Trunk Road, from West Bengal to north India and Afghanistan, Chef Arora has brought time honoured dishes and recipes to this restaurant. By accentuating new tastes and flavours from India's richly woven history, the menu at Moti Mahal is certainly a feast for the senses. The well stocked bar offers an impressive range of cocktails and aperitifs, including mojitos and champagne cocktails, many with an Indian twist. I suggested that my partner sample a traditional Mango Lassi, a cross between a smoothie and a milk shake. It did not disappoint, and is something every fan of Indian cuisine should try. Our meal commenced with a Fresh Salad Board, which you mix yourself with salt, oil and spices, cleansing the palette and whetting the appetite. 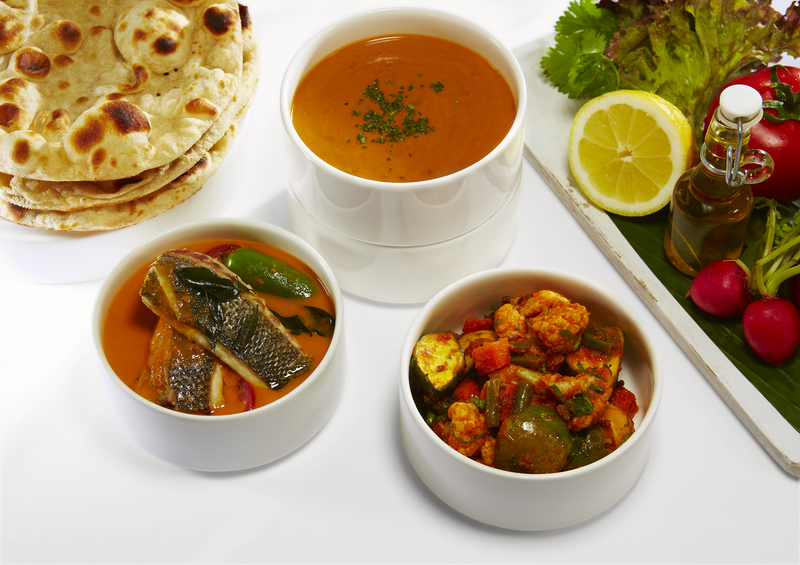 The starters (priced from £7) offer a mouth-watering range of dishes from various Indian regions. There are also dishes prepared in the Tandoori oven, and we were recommended the Gosht – a delicious, succulent and spicy Butterflied Leg of Lamb seasoned with bay leaf and cinnamon from the Hyderabad region. We also enjoyed a Naan bread flavoured with truffle and cheese. The wine list (from £28 a bottle) is broad and extensive, and we enjoyed white and reds to complement each course. The main meals are varied and interesting (price range £10 - £23), again from various Indian regions including Black Lentils, Slow Cooked Lamb, Spicy Lamb Curry, Spiced Halibut, Wild Mushrooms, Paneer, Baby Chicken and Beef Stir Fried. Since Moti Mahal allegedly invented the Murg Makali (Chicken Tikka Masala), I had to sample this signature dish – tender chunks of chicken, enrobed in a sumptuous, creamy tomato sauce. This is, without a doubt, the best Chicken Tikka Masala I have ever sampled. My partner enjoyed her Mappas (Cochin region) – succulent Tiger Prawn simmered in a tangy coconut and curry leaf sauce. Both main dishes, complemented with Steamed Rice and Daal, were cooked to perfection and highly flavoursome. Be sure to save some space for dessert. We sampled a few traditional desserts (we were there over Diwali) from the trolley, and enjoyed each one immensely. The service was polite, attentive and casual, and whilst very busy, the atmosphere was relaxing with families, couples, work colleagues and friends all enjoying the ambience. Moti Mohal seemingly offers a number of different concepts and services – you can undertake Cookery Classes, order private catering for a party, pop in for lunch or the Tiffin Lunch menu, and you can even purchase a recipe book ‘Food of the Grand Trunk Road’. There are often seasonal sharing and taster menus to sample, which can also choose to match with wines or beers. Until the end of March 2014 you could also be in with a chance of winning a luxury 8-day tour of India with Abercrombie & Kent, enabling you to experience your own adventure along the Grand Trunk Road. Speak to the restaurant for further information. This is much more than a regular curry restaurant – this is a dining experience not be to be missed, whatever the occasion.